Refreshed, miniature KAOSS pad with mp3 player and real-time control. Korg's KAOSS PAD Series products have become some of the must-have effect units on in every musician's rig - especially on the DJ scene. The original mini KAOSS PAD has earned enormous popularity for packing full-fledged effects into its compact body. Now, welcome the mini kaoss pad 2! 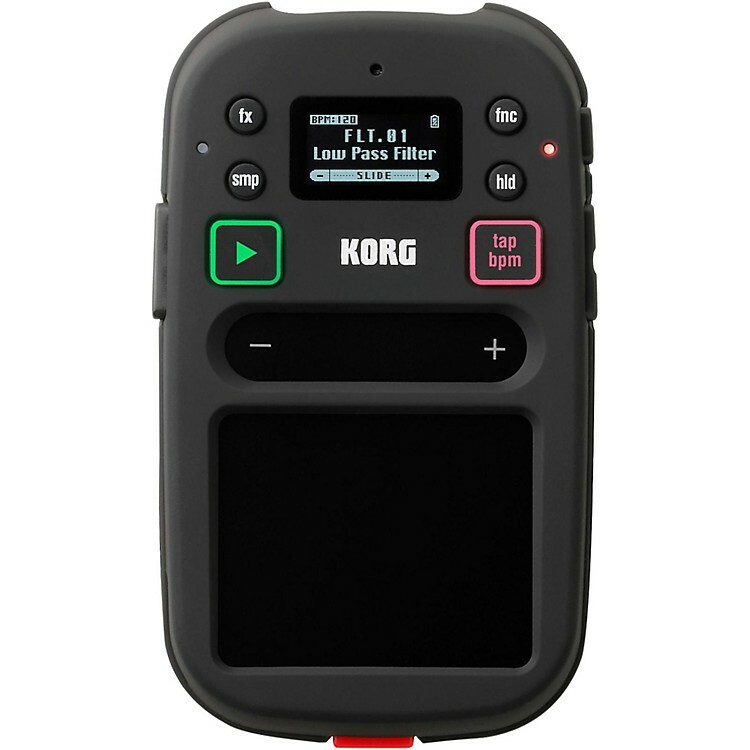 In addition to inheriting powerful effect programs from the KAOSS PAD KP3 and the KAOSS PAD QUAD, it provides an MP3 player with adjustable pitch, making the mini kaoss pad 2 unit ideal for creating DJ-Style performances. Use it as a DJ playback device, or use it to process the entire output of your DJ rig with Korg's famous KAOSS effects. Instrumentalists, guitarists, sound designers and even just music fans will enjoy using the mini kaoss pad 2.The Organic Electroluminescent (OEL) display provides superb visibility. Add to that a touch slider for ease of use, microSD card data saving, plus a built-in speaker and mic. All of these features reflect the enhancements incorporated into the sleek and exciting mini kaoss pad 2. 100 diverse, ready-to-play effect programs are packed into the mini kaoss pad 2, including many inherited from the KAOSS PAD KP3. These include standard effects such as Flanger, Filter, Delay, and Reverb, as well as new effects that first appeared on the KAOSS PAD QUAD: the powerful Looper, Vinyl Break, and Ducking Compressor; essential for the pumping, pulsing that drives today's EDM tracks. The Hold function freezes the effect parameters based on your finger's current location on the touchpad for hands-free operation. Auto BPM detection syncs the applicable effects to the tempo of the song, so that everything continues to move in sync for a professional performance. These features provide the mini kaoss pad 2 with extreme DJ potential. Need to really whoop it up on the dance floor? The mini kaoss pad 2 offers a built-in mic that can be used as a "shout" mic during your DJ performance to further energize the crowd. You can also apply the effects to the mic sound. Powerful effects that fit in your pocket! Call or click to order today.